Chairman Dave Camp (R-MI) of the House Ways and Means Committee has pledged to offer a tax reform package that would significantly reduce corporate and individual tax rates (to 10 percent and 25 percent for individuals, and to a top rate of 25 percent for corporations) while remaining revenue neutral over the ten-year budget window. The revenue neutrality would be achieved by eliminating many of the tax preferences found on the tax expenditures list published by the Joint Committee on Taxation (JCT). This list measures deviations from a hypothetical “normal” tax system, based on the broad-based income tax, as defined by JCT. Chairman Camp has also suggested that some consideration would be given to the revenues expected from faster economic growth, assuming the tax package would lead to a stronger economy. The greatest difficulty in crafting such a package lies in the fact that many so-called tax expenditures are necessary to avoid various types of double taxation of saving and investment that are built into the broad-based income tax. The “normal” income tax routinely taxes income used for saving and investment more heavily than income used for consumption. These income tax biases damage growth. Some of the major tax expenditures (including reduced tax rates on capital gains and dividends, all pension arrangements, and so-called accelerated depreciation) offset these biases to some degree. They either reduce rates directly or provide the equivalent of a tax rate reduction through their impact on taxable income. Repealing these tax expenditures would amount to a rate hike. To the extent that they offset the statutory rate reductions in the tax package, they will also offset any growth that the rate cuts are expected to produce. One such adverse trade-off consists of switching from the current Modified Accelerated Cost Recovery System (MACRS) to the Alternative Depreciation System (ADS). 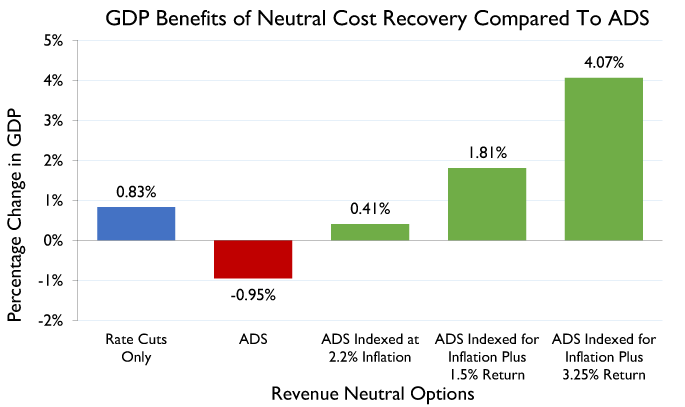 Cost recovery is slower under ADS than under MACRS. In many cases, asset lives are longer under ADS, and for any given asset life, the depreciation write-offs are more back-loaded than under MACRS. Because the deductions for investment costs would be delayed, the present value of the write-offs (adjusted for inflation and the time value of money) would fall. Taxes would be shifted forward in time, and the after-tax returns on the investments would fall in present value. The result would be less capital formation, lower productivity and wages, and less GDP. The tax base would shrink, and much of the expected revenue from the change in cost recovery would be lost as other tax collections fell. Any cost recovery system that falls short of immediate expensing denies an investor a tax claim for part of the cost of production. Profit is revenue less costs. Denying costs, in whole or in part, overstates real business profits. To that extent, the system is taxing revenue, not net income. It turns the tax, at least in part, into a gross receipts tax. Imagine the uproar if businesses were not allowed to fully and immediately deduct labor costs, the cost of raw materials, the cost of electricity for lighting or running machines, the cost of coal or natural gas for generating heat or power, or the cost of fuel for trucks, planes, or trains. That would clearly be an arbitrary violation of the concept of profit. 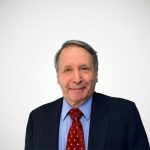 Yet the income tax routinely subjects investment in capital assets to exactly that by making the business investor wait years or decades to claim the cost of plant, equipment, or buildings on his tax form. We are so used to this practice that we forget what it means. Unfortunately, slowing down the pace of cost recovery allowances is one of the biggest apparent revenue raisers on the JCT tax expenditure list. It grabs a lot of money in the first five years of its implementation as new investments get lower tax write-offs in their early years. Beyond that point, revenues begin to slip back toward current levels, because the deferred cost allowances on assets bought early in the period begin to catch up with the slowed depreciation on new investments. Nonetheless, the switch from MACRS to ADS would appear to raise nearly $400 billion from the corporate sector over the budget window, enough to fund about 30 percent of the desired reduction in the corporate tax rate. ADS would raise about $250 billion from non-corporate businesses, helping to fund the individual rate reductions. The Tax Foundation’s Taxes and Growth Model (TAG Model) estimates that GDP would rise by about 0.83 percent if the tax rates were simply lowered by the amounts that moving from MACRS to ADS would supposedly pay for, but without actually changing the cost allowances. Labor compensation (wage rate and hours worked) would rise by a roughly similar amount. However, actually adopting the switch to the longer asset lives to pay for the rate reductions would raise the cost of capital (in spite of the rate cuts). The combined effect on GDP growth would be a negative 0.95 percent. Labor compensation would decline by a similar amount. Instead of being revenue neutral, the reform would lose money for the Treasury. Worse, it would reduce incomes and employment for the public. There may be a way around this difficulty, one that would offset the negative growth effects of shifting from MACRS to ADS. The solution is to modify ADS to retain more of the present value of the MACRS system while still allowing for slower write-offs during the budget window. Ideally, the modifications would go even further than matching MACRS, moving the present value of the write-offs nearer to the full cost of the investments. The ultimate adjustment would make them equal to one hundred cents on the dollar. That sort of full adjustment is called a Neutral Cost Recovery System (NCRS) because it treats all assets exactly alike, as they would be treated under immediate expensing. There is no distortion among assets and also no favoring of consumption over investment or of labor over capital. That is, capital expenditures would be treated as favorably as if they had been written off immediately, just as labor costs are written off. The rate reductions combined with NCRS could add more than 4 percent to GDP. 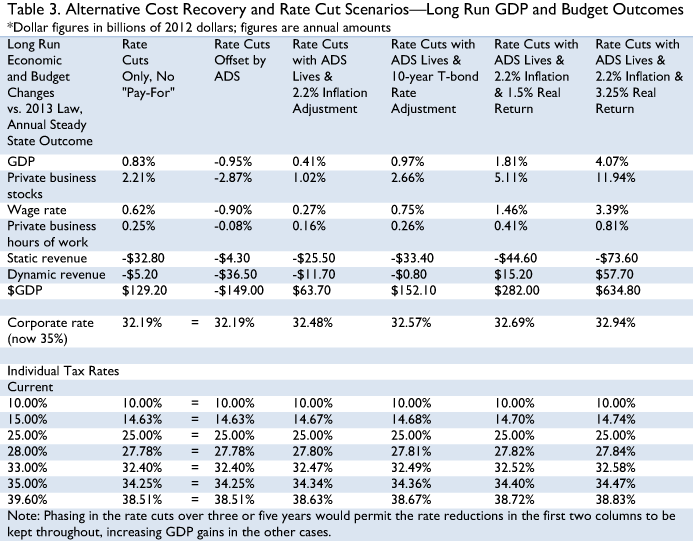 Table 1 shows the cost recovery deductions under several types of schedules. The asset in the illustration is a $100 machine expected to last five years. Inflation is assumed to be 2.2 percent (equal to the Congressional Budget Office forecast for inflation over the budget window). The time value of money for discounting deferred write-offs is assumed to be 5.45 percent. Under immediate expensing, the company buying the machine would deduct the full $100 cost in the first year and save $35 in tax in year one. Under MACRS, the company deducts the $100 over 6 years, as shown. The nominal write-offs sums to $100. However, at a 5.45 percent discount rate, the present value of the write-offs is $91.17. Costs are understated, and profit is overstated, by almost $9. The present value of the taxes the business saves is $31.91 instead of the $35 it would save if expensing were allowed, and so the after-tax cost of the machine is $3.09 (or 3.09 percent) higher than under expensing. Under ADS, the write-offs would still sum to $100, but their present value would only be $87.85. The after tax cost of the machine would be higher under ADS than MACRS, and less investment would be undertaken. However, if the ADS write-offs were adjusted (indexed) for inflation each year, their nominal values over the period would total $105.65. Yes, that is more than the $100 purchase price in nominal dollars, but that would just equal $100 in real money after inflation. The inflation-indexed write-offs would equal $92.57 in present value (after adjusting for both inflation and a real discount rate of 3.25 percent). The present value would exceed that of an unindexed MACRS if inflation is 2.2 percent. The asset would appear more valuable than under MACRS, and investment would rise, not fall, in spite of the slower write-off pattern. Alternatively, a more generous adjustment for the delay in the write-off would adjust the deductions each year for a market rate of interest, with a modest real return above inflation. In this example, we use the ten-year Treasury bond rate, equal to 2.86 percent as of this writing. The present value of the write-offs would be higher than adjusting only for inflation. Interest rates are unusually low at the current time. The next line adjusts the write-offs for inflation plus 1.5 percent, which would be nearer to a normal real interest rate for a ten-year Treasury bond and would yield a higher present value of the cost recovery. A discount rate of inflation plus 3.25 percent, the long run real return on private sector capital, would fully reflect the opportunity cost of tying up money in an asset. The present value in this case is equal to immediate expensing or $100 in cost deduction for the $100 machine. This would be full neutral cost recovery and would encourage the optimal, most efficient amount of capital formation in the economy. Augmenting the cost recovery allowances in these ways would somewhat reduce the amount of tax revenue raised over the budget window compared to a switch to an unadjusted ADS. Table 2 shows the amounts collected over the budget window under the five scenarios using the conventional static scoring. Static scoring assumes no change in economic growth, GDP, and revenue gains from higher incomes. If the Ways and Means Committee wanted to “pay” for these adjustments to ADS in a static sense, it could do so by phasing in the corporate or individual tax rate reductions over three or five years. For example, the static revenue saving for a phase-in of just the corporate rate is shown in Table 2. A three-year phase-in of the corporate tax rate alone ($88 billion) could cover the static cost of adjusting both the individual and corporate ADS by inflation or by the Treasury bond rate. A five-year phase-in ($210 billion) could more than cover even the most generous scenario of full neutral cost recovery. 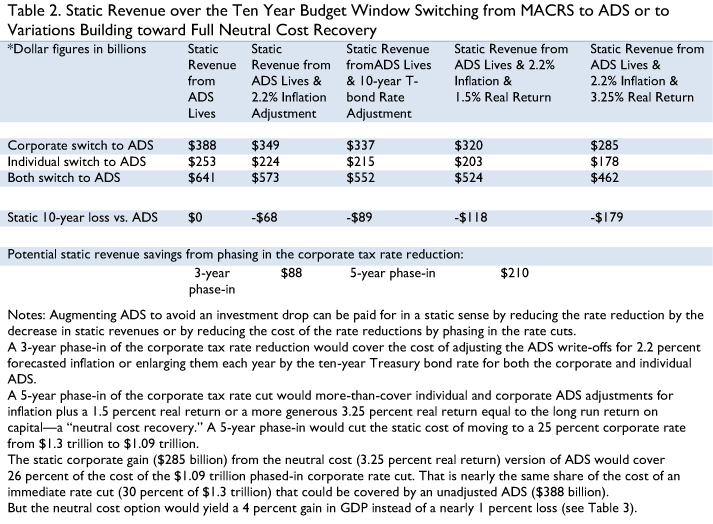 If the rate cuts are phased in, then the full rate reductions in the unadjusted ADS case could be adopted and paid for with room to spare over the budget window even with the augmented ADS write-offs. Inflation adjusting ADS would trim about 11 percent from the static revenue gain projected for the unadjusted switch to ADS in the budget window. Full neutral cost recovery would trim about 28 percent from the projected static gain. If the modified ADS systems are chosen, their budget window savings would pay for slightly less tax rate reduction than adoption of unmodified ADS. The lower half of Table 3 shows the amount of corporate and individual tax rate reductions that could be funded in a static sense over the budget window by adopting ADS or the variations shown. For each case, it assigns all the static revenue (from Table 2) that is assumed to be raised in the budget window from the corporate side of ADS to be used to cut the corporate tax rate and uses the individual ADS savings to cut the individual tax rates. Except for the first column, which shows a rate reduction that is not “paid for,” these cuts would be revenue neutral over the budget period (but not necessarily beyond). The upper portion of Table 3 shows the cumulative dynamic economic growth that would occur over time if these rates were adopted. In the “Rate Cuts Only” column, the rates are cut by the amount that a switch to ADS would pay for, but without actually making the switch. In the “Offset by ADS” and later columns, the switch is assumed to be made. The static revenue numbers are annual figures for the long-run steady state, beyond the budget window, after the transition from MACRS to one of the alternative depreciation regimes. The dynamic revenue numbers reflect the annual long-run gains for the economy after all economic adjustments (about ten years out). These figures are after the initial revenue gains from the conversion to ADS are mostly dissipated. On a static basis, the augmented write-offs would appear to lose significant revenue in later years, while the unadjusted ADS would almost break even. However, on a dynamic basis, three of the four augmented write-off systems would either break even or raise revenue, while the unadjusted ADS would lose significant revenue. Full NCRS would raise revenues by nearly $58 billion a year. Our TAG Model indicates that cutting the corporate and individual tax rates by the amounts shown without switching from MACRS to ADS would add 0.83 percent to GDP. Paying for that same amount of rate reduction by switching to ADS would reduce GDP by about 0.95 percent and would lose revenue due to the weaker economy. However, adopting the modified ADS systems would result in economic gains. Merely adjusting ADS for inflation would restore more than three-quarters of the growth lost by moving from MACRS to ADS and would result in a small net expansion of GDP. It would have a modest long-run revenue loss but that would be less than a third of the dynamic revenue loss under an unindexed ADS. Slowing capital cost recovery to pay for an equal dollar amount of tax rate cuts over the budget window may appear to be revenue neutral in the near term. Unfortunately, this ignores any effects on economic growth. Slower cost recovery would overstate and overtax profits by effectively disallowing some of the cost of capital investment, which would discourage capital formation, reduce the growth of GDP and employment, and end up losing revenue near term and long term. If the longer asset lives and slower write-offs are adjusted for inflation, or inflation plus a normal return on capital, the picture brightens considerably. The reform can still be revenue neutral during the budget window, but the incentive to invest would be greater than under current law, instead of lower. Capital formation would increase, not fall. The losses in GDP due to the restricted capital cost recovery would be reversed, GDP and personal incomes would rise, in some cases significantly. Such a reform could actually succeed in raising revenue and reducing the deficit longer term while increasing economic growth. It bears noting that there is some disagreement about what constitutes a “normal” income tax system and that any definition necessarily involves some arbitrary assumptions. It also makes businesses wait to declare the cost of inventory until it is sold. That is no problem for perishable groceries that sell in days. It is of more importance for items that stay on the showroom floor for months or years. The forecast revenues under ADS would never fall all the way back to MACRS levels. In a growing economy, investment outlays increase year over year, so the saving from the slower cost recovery would rise from one year to the next after all investments were converted over time to the ADS system. The 5.45 percent discount rate is equal to 2.2 percent forecast inflation plus a 3.25 percent long run real return to capital. The asset is assumed to have been bought mid-year. The company gets a partial write-off in the first year and takes the balance in the sixth year. This would not be “excess write-off” in any real sense. Current accounting practices ignore inflation, but inflation-adjusted write-offs would merely preserve the real value of the deductions. Use of a Treasury bond rate reflects the relatively risk-free tax saving from having a deduction. We use the mid-length bond in the example. One could instead use different Treasury rates on bonds of varying lives corresponding to the asset lives in question, such as the five-year bond rate for a five-year asset, a ten-year bond for a ten-year asset, and the thirty-year bond for 39-year or longer buildings. This consideration of the present value of a dollar of cost or tax over time is merely a recognition of the time value of money. Current accounting practices do not take the time value of money into account, but doing so for tax purposes would avoid distorting investment decisions and depressing capital formation. The Kennedy corporate and individual tax rate reductions were phased in over two years, 1964 and 1965. Again, if the rate cuts are phased in, then the full rate reductions in the ADS case could be adopted, and the growth estimates would be higher than shown here.